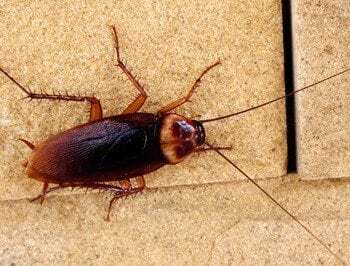 The sight of just one cockroach in your facility, store or restaurant can be enough to damage your brand. Preventing cockroaches from entering your business in the first place is key to preventing an infestation. Following the below tips can help reduce the chance of cockroaches invading your business. Sanitation and cleaning are critical to preventing a cockroach infestation. It is the responsibility of every employee to make sure that there is no food or water available for cockroach survival. Eliminate all sources of moisture, water, or condensation. Wipe or clean up spills immediately. Do not leave wet and dirty mops on the floor. Keep drains clean, using a stiff brush on occasion, to reach places where liquid cleaners don’t flow. American cockroaches love dirty drains. Consider the cleaning schedule the minimum requirement. Additional, or more frequent, deep or detail cleaning is always helpful. Inspect incoming shipments for cockroaches. If a supplier is transporting cockroaches with the rest of a delivery, consider other options. Do not accept cockroach-infested or questionable deliveries. Remove cardboard from the premises immediately. German cockroaches (and lots of other pests) love to hide in corrugated cardboard. Avoid clutter and don’t store any supplies for more than 30 days. Report any sightings of live cockroaches to your pest management professional. If possible, kill or capture the cockroach. Record the date, time, and exactly where the cockroach was found. Use pest monitors in warm and/or moist areas to detect the early stages of an infestation. If cockroaches are detected, contact your pest control provider immediately to identify the species and recommend appropriate control measures. A cockroach problem is easier (and less expensive) to control if detected early. Each location is unique. Ask for cockroach prevention tips from your experienced pest management professional who is familiar with your situation.